So how do you know what taxes you will be paying and how to handle them? The answer is simple. There is a website you can go to that has the answers for you. They even have forms you can download and use. The website is http://www.business.gov/finance/taxes/.In realty the above website can be your one-stop resource for most, if not all, of your business start up needs. You can even seek help and advice to help you as you run your business. So take advantage of this resource. Learning the Right Type of Insurance to Get Every business needs insurance. What if you have an accident? Or you get sued for some reason? What if some kid was playing on your equipment and got hurt. You will need to cover yourself. As such you will need to have insurance. The question is what type of insurance do you need? Also, depending on the type of business you are operating will determine the type of insurance you will need to purchase. To get the right answers, there is a great resource that can help you. Just go to:http://www.business.gov/finance/business-insurance/.They have a section that lists everything you want or need to know about obtaining insurance. For a listing of insurance companies that specialize in businesses in the inflatables industry visit http://www.junglejumps.com/insurance-agents.phpPart Three: Creating the Business Operations and Management PlanUnderstanding the Business PlanIf you think about it, a company cannot do well without some direction. In today’s competitive world, you must have a business plan, if you intend on even making it in your niche. To run a business properly, you must have a business plan in place. This helps guide you and every decision you make. Businesses that follow a business plan find they are more successful than those who aren’t. 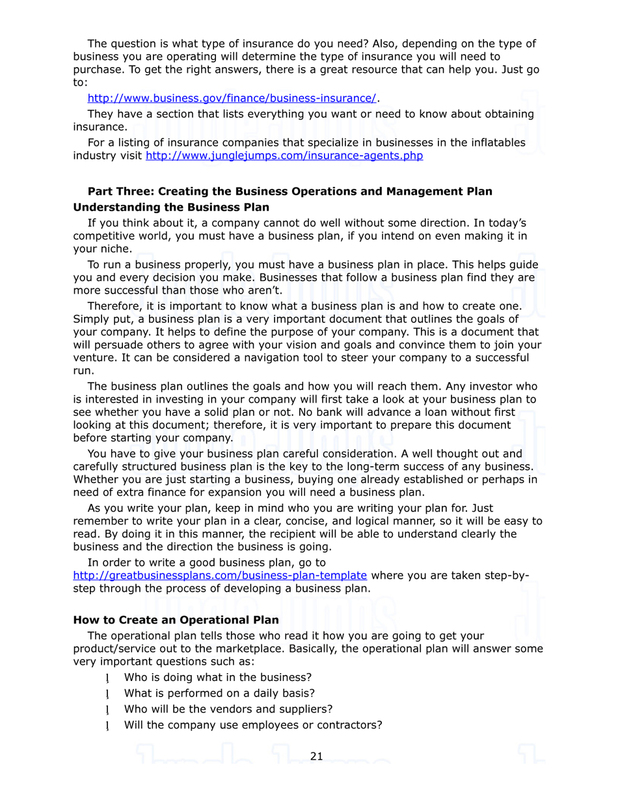 Therefore, it is important to know what a business plan is and how to create one. Simply put, a business plan is a very important document that outlines the goals of your company. It helps to define the purpose of your company. This is a document that will persuade others to agree with your vision and goals and convince them to join your venture. It can be considered a navigation tool to steer your company to a successful run.The business plan outlines the goals and how you will reach them. Any investor who is interested in investing in your company will first take a look at your business plan to see whether you have a solid plan or not. No bank will advance a loan without first looking at this document; therefore, it is very important to prepare this document before starting your company.You have to give your business plan careful consideration. A well thought out and carefully structured business plan is the key to the long-term success of any business. Whether you are just starting a business, buying one already established or perhaps in need of extra finance for expansion you will need a business plan.